Warehouses have long been considered important for holding and preserving crops. But warehouses can also potentially solve liquidity issues for farmers. Prices for commodities are depressed immediately after harvest because most farmers bring their crops to the market and this excessive supply pushes the prices down. This means that farmers have to settle for prices that may not be remunerative. Small farmers don't have the financial wherewithal to hold their crops. According to the NSSO, in the year 2013, almost 86 per cent of the Indian farmers held less than 2 hectares of land. Of these 86 per cent farmers holding less that 2 hectares of land, 80 per cent farmers held only 1 hectare of land. The same report points out that every month farmers holding upto 1 hectare of land spent Rs. 1213 more than they earned. In case of farmers with upto 2 hectares of land, the dissaving was of Rs. 469 per month. Small farmers depend on the earnings of one harvest to finance sowing the next and therefore cannot store their crops and wait. Another reason farmers don't store their crops is because farmers need money to repay their loans. In absence of access to formal sources of finance, small and marginal farmers borrow money from arhatiyas and other middlemen at very high interest rates. Farming is a resource intensive business. Cultivating a crop requires seeds, fertilizers, pesticides, water and fuel. Farmers usually procure these inputs on credit. The arhatiyas lend money to farmers at a exorbitant interest rates ranging from 24 per cent to 45 per cent per annum. This creates a pressure on the farmers to sell their harvest as soon as possible and repay the money to the arhatiyas. Warehouses are usually far from the production centres and closer to mandis. Farmers don't find it viable to transport small quantities to warehouses. This is because the transportation costs, storage charges, loading and unloading charges end up exceeding the remuneration. This is why farmers prefer to sell their produce to a local village-level middleman who can aggregate crops of various farmers and take the entire stock to the mandi. There do exist some godowns in rural areas but such warehouses are not equipped to scientifically store and preserve the crop. The Government started Grameen Bhandaran Yojna in 2001 to encourage scientific warehousing in rural areas but this study reveals that most godowns built under the scheme did not conform to the quality parameters for scientific warehousing. When a farmer stores his crop in a warehouse, he's in effect leaving his entire wealth in the hands of people managing the warehouse. Leaving his wealth in either an unsecured place or unreliable hands is a risk that a small farmer cannot bear. Which is why, farmers are reluctant to store their produce. How would we address these problems? Warehouses are not simply storage points. Warehousing is a combination of the product (the warehousing facility) and the service (warehouse management). Until now, the warehousing regulations in India focused only on the physical attributes of the warehouses, things such as the plinth height, ceiling and flooring. However, the warehouse service providers need to be assessed on the basis of their ability to preserve quality and make good for any losses (if incurred) to depositors. Warehousing Development and Regulatory Authority (WDRA) is currently in the process of re-writing its warehouse registration rules wherein the focus would be on the systems and processes for warehouse management, heightened disclosures and making more information available to market participants. These requirements will ensure that the warehousing space is occupied only by those who have the financial, managerial and technical strength to do the business of warehousing. In addition, WDRA intends to bring in a system of grading warehouses which will help in differentiating warehouses as well as bridge the information gaps in the warehousing sector. The system of grading will generate and encourage a system of information creation that will be useful for farmers to identify the warehouses in their proximity that they can use to store their crops. Farmers avoid going to mandi because the transportation charges, loading and unloading charges make the entire deal unviable. 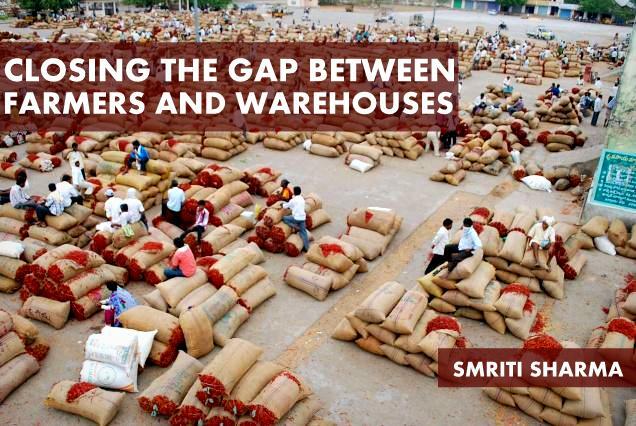 If WDRA registered warehouses could be recognized as sub-market yards as suggested in this article, then the distance between farmers and buyers could be reduced. Farmers could use warehouses as a point of storage until the time the market turns favourable. In the meantime, the stock could be pledged to avail loans from banks. Currently, the warehousing market largely offers a physical storage receipt against which farmers can get their stock financed. Banks lien the stock, place an external collateral management company to secure the quantity and quality of stock. With negotiable warehouse receipts issued by WDRA-registered warehouses, farmers would be able to transfer the ownership of their commodity without having to make physical deliveries. This will save costs for farmers and encourage them to store their crops in warehouses. Small and marginal farmers with their small yields are unable to interest the buyers to procure crops from them directly. This re-inforces the dependence of farmers on aggregators. Some states in India have done away with the APMC Act to enable farmers to market their produce directly. However, farmers continue to depend on middlemen to buy their harvest and sell it further. This issue of dependence cannot be solved unless small farmers achieve scale which is also their Achilles' heel. Farmers need to aggregate their produce so that they can collectively rent warehouse, market their produce and negotiate better terms for procuring farming inputs and loans. This form of aggregations is already being tried out with farmer producer organisations (FPOs) and primary agricultural cooperatives (PACs). Some success stories have been shared here. To encourage aggregation among farmers, NABARD has set up a Producer Organisation Development Fund (PODF) to provide credit support to any registered producer organisation by way of grants or loans or both. More steps in the same direction need to be taken. Warehousing is both a need and the solution to farmers' post harvest crop management. WDRA is hoping to reform the warehousing space with better registration requirements, inspection and supervision mechanisms. This will instill a lot of confidence among the users of warehouses including the farmers and the banks. This in turn will help bridge the distance between the farmers and the warehouses. Author extends her thanks and gratitude towards Amey Sapre for the critical inputs on the subject of this article. This article was originally published at Ajay Shah's Blog on July 2015.